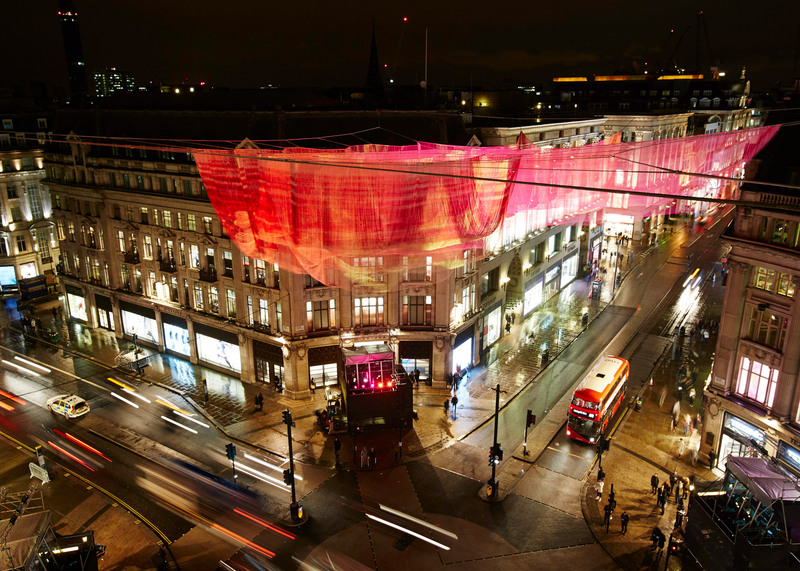 American artist Janet Echelman has suspended a billowing woven sculpture based on data captured from the 2011 Japanese earthquake and tsunami above London's busy Oxford Circus junction (+ slideshow). Echelman's 1.8 installation is held up between the four buildings on the corners of the crossroads, where it is illuminated at night. 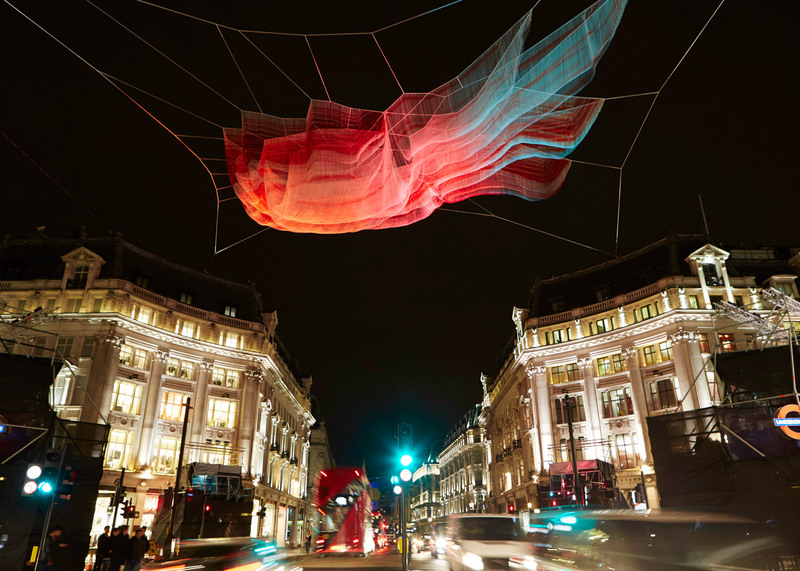 It is one of several lighting-based artworks to be installed across the UK capital for the Lumiere London event, which kicks off today. The design is similar to Echelman's previous aerial sculptures, like the giant piece that floated above a park in Boston last summer. Created specifically for its London location, the new 1.8 artwork is based on the seismic disaster that struck Japan in 2011. The title of the installation is based on the number of microseconds that the day of the earthquake was shortened by. "You expect a tsunami or earthquake to have a physical impact on water, but you don't expect it to have an impact on time and the rotation of the Earth being shifted," Echelman told Dezeen. Its shape was created using data of recorded wave heights as the resulting tsunami rippled across the Pacific Ocean. 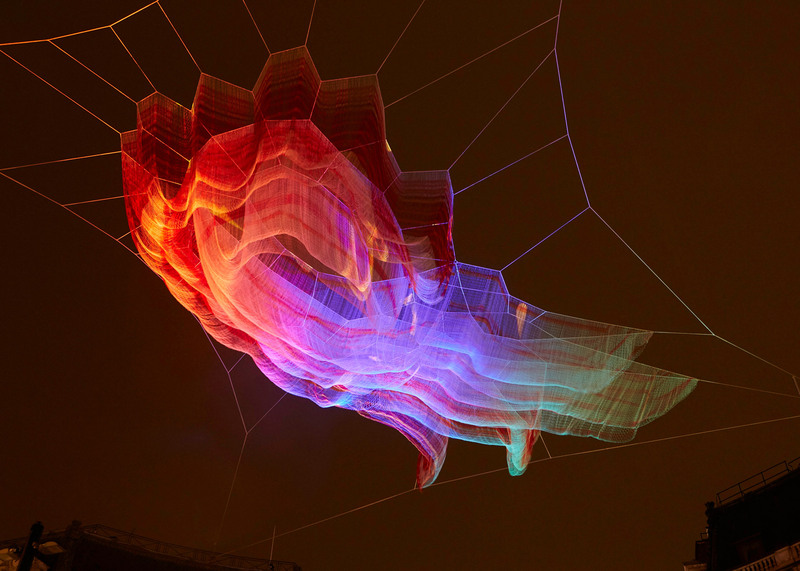 Echelman used Autodesk computer design software to transform the data into a three-dimensional model, made up of an intricate mesh of diamond shapes. This was then recreated with custom polyethylene fibres that are knotted together by loom and by hand to create the draping form. "Every rope is hand-spliced in ways that have been used for two thousand years along the banks of the River Thames," said Echelman. 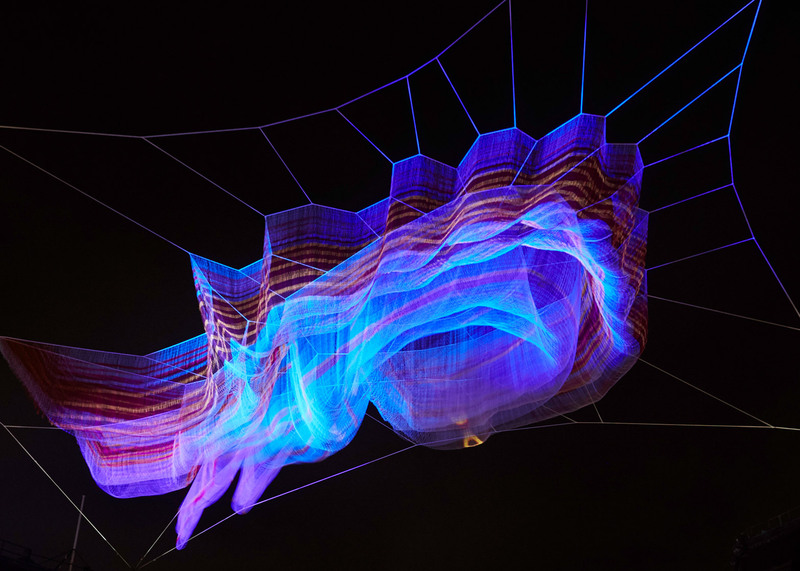 The fibres – some of which Echelman claims are 15 times stronger than steel – are pulled taught across the top from the four connection points. The rest of the red-hued threads rely on gravity to cause them to drape below and the breeze to gently move them in ripples. At night, the piece is illuminated with coloured projections that are determined by nearby smartphone users who choose to participate. When connected to a dedicated Wi-Fi network, visitors can load an image of the artwork and select the hue they want to appear. By touching different sections of the picture on their screen, they can also dictate where these hues appear on the physical sculpture and view how their fingerprint interacts with others. 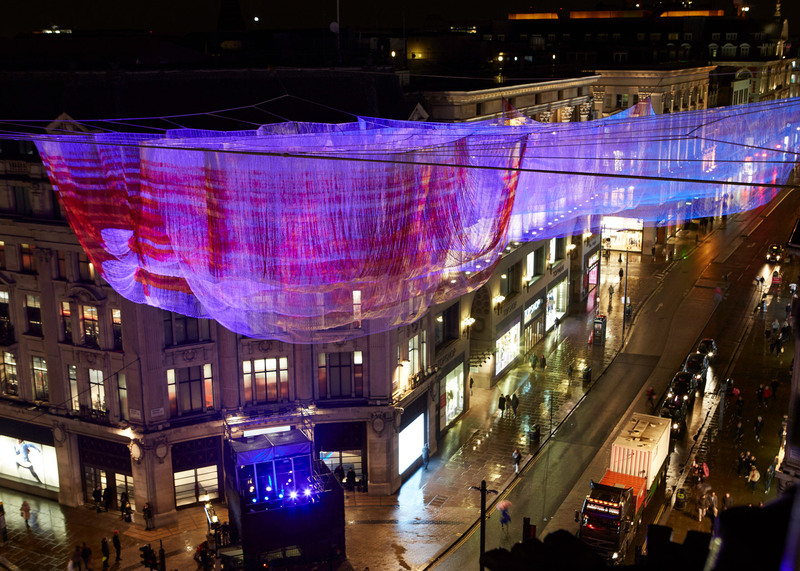 "It's up to us how we want to use it," Echelman said. "You're using your phone to connect to one another in real space and time." To install the giant sculpture, the surrounding roads were shut in the middle of the night while the four corners were winched into place. "My sculpture comes as a single piece, it's like a custom knitted garment for the city," said Echelman. "It exactly fits the site. Each rope is labelled and it unfurls as it is winched up, and then it is tightened in place." 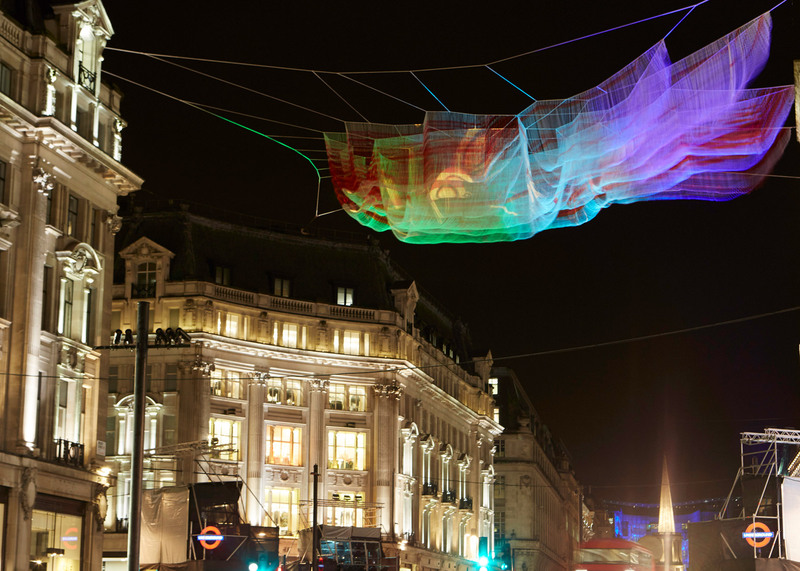 1.8 will remain in place for the duration of Lumiere London, which runs from 14 to 17 January 2016. Night photography is by Matthew Andrews.